In a large type family (5 widths), how would you name the widest width? It is really wide. The widths already set are: Compressed, Condensed, Regular and Wide. Which one of these choices sounds natural: Extended, Expanded or ExtraWide? Any other suggestions? Also, among the weight styles are ExtraLight and ExtraBold, so in case the choice falls to ExtraWide, one style could end up being named "TypeFamily"ExtraWide-ExtraBold (not sure how this feels to a native English speaker). Thanks Hrant. I would ask you to elaborate, but that was pretty self-explanatory. Maybe rename ExtraBold to either Heavy or UltraBlack. Then use UltraExpanded, UltraExtended, or ExtraWide for the widest width. The difference between compressed and condensed seems understandable, but personally I never sure which is the more wide: Extended or wide, and likewise expanded or wide, they both fall short in relation to one another. Extra Bold Extra Wide makes perfect sense, to this English speaker. I've set Heavy and Black for heavier weights already. The name "Ultra" makes Illustrator act funny, so I'm avoiding that. I think these names are more intuitive for users than Condensed/Extended, and are also shorter, which is helpful for some font menus. 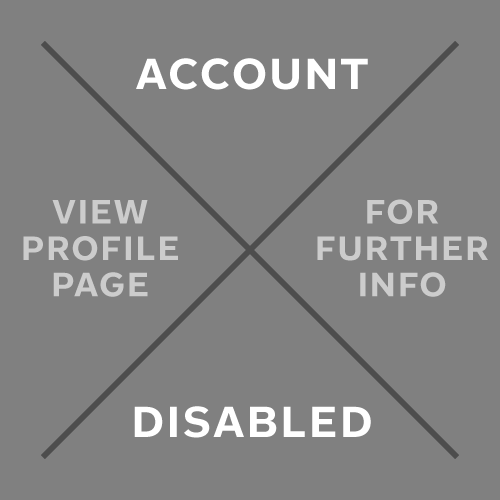 Extended is a term understood by older typographers. "Wide" seems more descriptive and likely to be literally understood better by a broader audience. "Extended" can mean more languages included to some people. Looks like Extra Wide is the way to go then. Then there is the confusingly named Century Expanded, which was a narrower version of Century. It was called expanded because it expanded the amount of text you could fit in the same space. This usage never caught on. @Erwin Denissen @Johannes Neumeier @Nick Shinn @John Hudson @Chris Lozos Thanks everyone for your input! It is highly appreciated! Plus it coolly evokes Soul Coughing's "Blueeyed Devil". To make quick recognition of styles easier, you could use "extra" for weight only (ExtraLight, ExtraBold) and for width, use "ultra" (UltraWide). Or the other way around. Century Expanded … was a narrower version of Century. It was called expanded because it expanded the amount of text you could fit in the same space. One of the younger Benton’s early assignments was redesigning Century Roman, extending it slightly to meet the Typographical Union standards of the day, on which rates for typesetting were based. The result was named Century Expanded, issued in 1900. 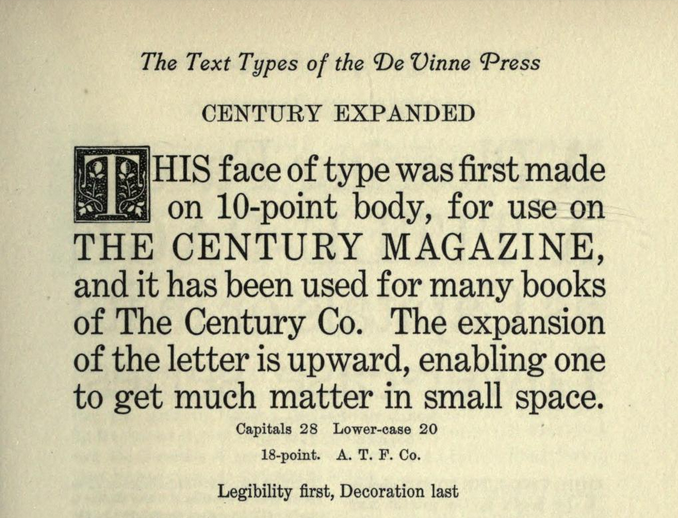 DeVinne, showing it in his company specimen book, said, “The expansion is upward, enabling one to get much matter in small space”—essentially what he had said of the earlier face. But it is obviously expanded in width also, compared with the original face. Image from Types of the De Vinne press; specimens for the use of compositors, proofreaders and publishers, 1907. Isn’t this 125th anniversary of the day they decided to stop naming font sizes and started giving them numbers? I’m a fan of extra wide, but it makes the name long which doesn’t always work well in menus. I'm a fan of X-, for both Wide and Narrow/Compressed. Works a little better in menus. Then you have the Ai problem of sorting fonts in an order only known to Socrates! Ah, Ben. Nice to meet you (so to speak). I think Aspira was the first super-family I purchased...certainly the one with the most faces. And I do appreciate the naming scheme. Chris Lozos: Then you have the Ai problem of sorting fonts in an order only known to Socrates! Chris, I’m afraid you are just wrong. 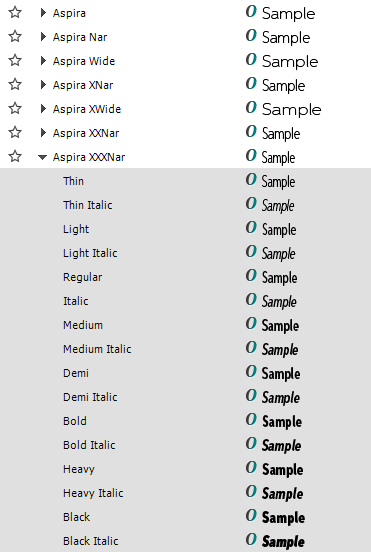 In Illustrator, the sorting order of fonts is exactly the same as in InDesign. At one time, this style sorting was provided by the shared Adobe CoolType library (and I helped verb* Sairus Patel's sort more than once, back in the day), but obviously at some point the apps diverged. Bummer. Back in the day, sorting of styles within the family was done using width, then weight, and then slope. Width and weight were first grabbed from usWidthClass and usWeightClass when possible. Slope was based on the appropriate style bit, first. Of course, voodoo or magic was required if the family was believed to not have correct metadata. * Where "verb" is somewhere in between review, provide feedback, and specify.